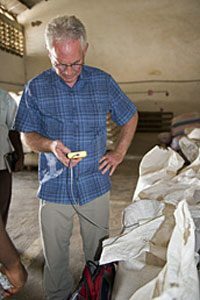 ARS agricultural engineer Paul Armstrong uses the “Post-Harvest Loss moisture meter” to check bags of stored maize in Ghana. U.S. Department of Agriculture (USDA) scientists have developed a new way for farmers in developing areas of the world to determine the moisture content of their stored grain. Such determinations can help prevent losses due to insects, spoilage and mold growth that can render grain unfit for consumption. Unlike in the West, farmers in underdeveloped countries use large bags rather than bins or silos to store grains like corn, according to Paul Armstrong, an agricultural engineer with USDA’s Agricultural Research Service (ARS) in Manhattan, Kansas. Together with Kansas State University colleagues, Armstrong developed a hand-held device that could provide a fast, low-cost way to check the moisture level in grain bags. The meter works by measuring the relative humidity and temperature of the air within the grain, two key parameters that are used to estimate moisture content, explains Armstrong, with the ARS Center for Grain and Animal Health Research. The device, known as the Post-Harvest Loss (PHL) moisture meter, costs about $75 to make, is easily made with “off-the-shelf” parts and requires no special equipment or facilities. Key features include a probe that’s inserted directly into a bag of grain to measure moisture. Readings appear on a small display window after about six minutes. Read more about the new moisture meter in the March 2017 issue of AgResearch.